Mechanical Cleaning - Mechanical cleaning processes at Clean Sciences Technology supplement chemical based cleaning operations. Clean Sciences Technology is experienced in CO2 ice blasting and all types of abrasive media and can precisely control surface finish. 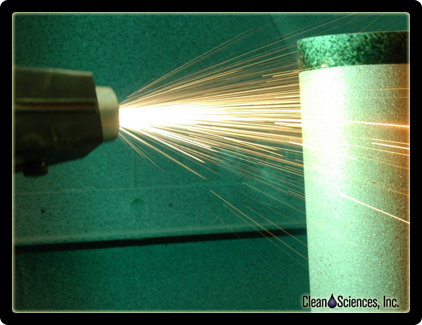 TWAS - Twin Wire Arc Spray – Clean Sciences Technology uses TWAS (Twin Wire Arc Spray) to coat virtually any metal on a variety of substrates. TWAS can be used as a sacrificial coating to reduce particle generation and increase time between shield maintenance cycles, as a thermal bond and match layer, wear resistant coatings, or to otherwise change the appearance and surface finish of parts. Equipment Maintenance Kits – Clean Sciences Technology provides turn-key maintenance kits to save you valuable time and resources. All type machine maintenance kits can be created. Clean Sciences specializes in thin film vacuum system kits for PVD, Evaporation, Sputter, CVD, MoCVD, Etch, Ion Beam, and PECVD from manufactures like Applied Materials, Novellus, Varian, MRC, CPA, Perkin-Elmer, CVC, Comptech, Intevac, Veeco, Temescal, CHA, Hitachi, STS, Plasma-Therm, Balzers, and others. Precious Metal Recovery – Clean Sciences Technology works with our customer to maximize the value of their waste stream. Clean Sciences offers a custom tailored solution to suit your unique metal recovery needs. Clean Sciences Technology processes include dedicated equipment within a secure facility. Please visit our sister company, CST (Clean Sciences Technology) Specializing in Bead Blasting and Arc Spraying. Copyright © 2013 Clean Sciences Inc. All rights reserved.